They’ve been open to new ideas and have challenged us when they thought a particular feature wouldn’t work in the app world. The Distance has guided us in terms of what makes for good app development. 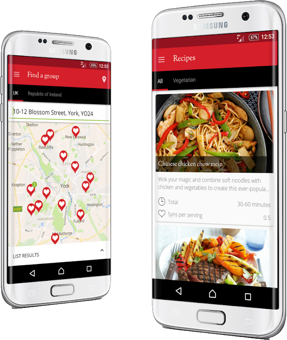 Slimming World's existing apps needed a renewed direction as the existing proposition was confusing and very dated; offering limited support for existing members. After an initial quick release to meet the New Years uptake, The Distance now work as partners to help define the apps direction, bringing extra value services to Slimming World members. The app has had almost 5 million downloads and continually supports 200,000 active users each month. It has also led to a significant increase in newsletter sign-ups - over 20,000 in the first year. I love using this app, it’s perfect for when I’m out shopping or if I’m going out for a meal, I can use the food search option to find the syn value of pretty much anything! So quick and easy to use and lots of motivational success stories to give you a boost. Fantastic resource, especially for recipe finding (just type in an ingredient you want to use and it will show you recipes) syn checking and when grocery shopping in the supermarket. Can’t manage without it! I love the Slimming World App. I’ve got it on my iPad and iPhone. Keeps me in check. When I do my weekly shop I can use this app for syn values. Love it.